The final few weeks of Summer are upon us and it’s time to think about professional development opportunities for Fall. This coming September and October marks another five-session Nonprofit Supervision & Management Series offered by ONEplace@kpl – the nonprofit management service center funded by the local foundation community. This is the fifth Fall in a row we’ve delivered this course for ONEplace and the participation has been great each time. In previous years the course has been offered on five successive Monday mornings with a limit of 40 participants. We’ve wanted to increase the involvement of participants which just isn’t possible with a group of 40 people. So this year there will be two groups participating in the course, a group on Monday and another group onThursday mornings. Each class has an enrollment limit of 20. If you work for a Kalamzoo area nonprofit you can keep an eye on the ONEplace website for details and times as well as all the other great programs and services provided by Thom Andrews and staff. For those outside the local area, contact us to learn how you can bring this course to your nonprofit community. Last time we suggested taking a look at which of your working relationships could use some attention. If you’ve been truly honest in your self-examination, you probably have discovered one or more key relationships could stand some improvement. Perhaps you’ve neglected one of your high-performers to focus more attention on a marginal performer. Or you may tend to avoid dealing with a co-worker who kind of rubs you the wrong way or who you frankly don’t like much. Whatever the situation, unless you do something to change the equation, the relationship is unlikely to improve. It might continue to deteriorate if you do nothing, but it’s unlikely to improve on its own. So, what could you do? Why is this relationship important to me? Why do I feel the relationship could be better than it is right now? What would be the ideal relationship with this person? What would I be willing to do in order to improve it? Once you’ve examined the current state of the relationship, it’s time to decide what you want to do, and when you intend to do it. Realize that there may be no single “best” thing to do or say; the key here is being willing to try different things and keep at it as long as it takes to see the relationship improve. Be patient! – most problem relationships did not get that way overnight; they won’t improve overnight either. Be interested in the other person’s ideas, suggestions; ask for their opinion. Realize that changing the relationship is up to you! As Stephen Covey so eloquently said, “seek first to understand, then to be understood.” If we think more about understanding the other person, seeking their perspective, asking for their ideas, and seriously listen to what they have to say, that cannot help but move the relationship in the right direction. What Are Your Key Relationships? Mary Jo Asmus, my long-time colleague, coach, and friend frequently reminds us, “it’s all about the relationships.” As we work with management teams and individuals one question that deserves asking is, “which relationships are most important to you?” It’s a simple question, but one that really does benefit from thoughtful consideration. After all, not every relationship in your work and your life is equally important to you and to your success. And yet, one of the major reasons the failure rate for newly promoted or hired managers is so high (40% in the first 18 months!) is failing to build cooperative working relationships with employees or peers. Your Manager – In most cases the relationship with your manager . . . your boss . . . is pretty high up on the importance scale. During several decades of working in organizations I reported to a variety of different bosses. Some were excellent managers; some were mediocre managers, but all of them gave me a fair amount of freedom to do my job as I thought best. That freedom was great, but it also meant I seldom had much in the way of detailed expectations about what they wanted. If your particular boss is a big-picture person – intuitive, future-oriented, a bit bored by all the details, you’re unlikely to get a lot of specific details . . . well, about much of anything, to be truthful. That means getting the details figured out is up to you. If your boss has a constant laser-like focus on the details of your job, good luck – you are working for a micro-manager. Regardless of their style, it just makes sense to pay attention to building and maintaining a healthy relationship with the one you report to. Your Peers – You also have key peers . . . other supervisors or managers who are generally on a similar level in the organization. Maybe they are “upstream” or “downstream” from your unit or team. In other words, their team’s results or output has an important affect on how you and your team produce your results. Or, the peer’s team may be the primary recipient of your team’s output. In either case the relationship between you and the peer (and realistically between your team and theirs) is really a key relationship. Your Employees – Almost certainly your direct reports . . . your employees . . . are important relationships for you. After all, the results they produce have a huge impact on how you are perceived as a supervisor. Great results and you are viewed as a good manager. Crappy results and you are viewed differently. Perhaps a long-time employee is about to retire and you need to do some succession planning so you don’t lose their experience and wisdom when they walk out the door. Maybe a new member of the team seems to be struggling to find their place in the group. Whatever the current situation, building successful relationships with your employees has a direct bearing on your success as a supervisor or manager. It makes sense to give some thought to the relationships in your professional life. Which are the “key” relationships? Who are the people whose good opinion you value the most? Who has the ability to help you or hinder you professionally? Once you are clear about which relationships are most important, then you have to ask yourself to honestly (and I mean being really honest) about the current state of those relationships. Which relationships could use some improvement? Is there a key relationship that needs work if you are going to be successful in your current job? How would you rate each of your working relationships on a scale of 1 – 5? A 1 or 2 would indicate lots of room for improvement, while a 5 would be a successful relationship . . . good communications, high levels of trust, the ability to count on the other person’s support, the willingness to resolve questions and issues cooperatively . . . all those factors that go into building successful relationships. Give the questions some thought. Next time we’ll have a few suggestions that may just help improve a key relationship or two. Fear my boss will fire me; I could be without a job, lose my house, etc. Fear people will realize I don’t really know what I’m doing. Fear others will think my ideas are silly or unworkable. Fear I’ll be viewed as not a “team player” if I disagree with plans or priorities. Fear I’ll make a bad decision, support an unsuccessful initiative, or chose the “wrong side” in disputes within the team. Fear of . . . some unknown something that might happen someday. Recently I worked with a nonprofit arts organization where most of the above fears seemed to be operating. Even the director exhibited some level of fear. As you can imagine, the atmosphere and energy around the group was decidedly negative; people were constantly watching their back. 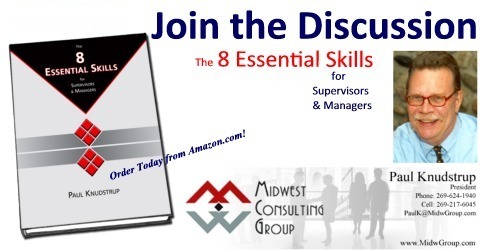 In “The 8 Essential Skills for Supervisors & Managers” Freedom from Fear is described as the “foundation” of Skill 3 – Building Successful Relationships. When the relationship is one based on Fear, the higher-level aspects – honesty, trust, personal interaction, acceptance, good communication, development and growth, mutual benefit – simply cannot happen. Recently we looked at the related roles of Teacher and Coach. Today I’d like to focus on the roles of Interpreter and Decision Maker. Interpreter – Every organization develops routines and standards. From the gas station or shoe shop on the corner to the biggest governmental agency . . . from the local storefront church to the billion-dollar worldwide nonprofit agency . . . all organizations have rules, policies, and procedures. They may be formal and written or they may be informal and unwritten. Whatever those rules are, as a manager you’re responsible for teaching, guiding, interpreting, and explaining the rules to each of your team members. What are the rules, policies, and procedures in our organization? How do we do the work and why do we do it that way? Merely handing down the rules and explaining how to carry them out isn’t enough; people need to know why so they can truly understand “how we do things around here.” Once they understand the what, how, and why, they’ll be much more likely to do what needs to be done in the way it should be done. Decision Maker – Managers make decisions all the time. Who to hire . . . what to have them do . . . what tasks take priority over others . . . which team members should attend a new training program first . . . when to start doing something new . . . when to stop doing something that has been done in the past. Making decisions is part of every manager’s daily life. Some of us enjoy making decisions, seek opportunities to make decisions, and make them quickly. Others seem to struggle with making even the simplest decision. They postpone, waffle, beat around the bush, and change their mind a dozen times. Over time and with practice, you’re likely to get more comfortable with this role. You’ll see that making decisions too quickly can lead to consequences you hadn’t thought of. At other times you’ll need to make a decision quickly, before you miss an opportunity. Shoot from the hip? Sleep on it? Regardless of how you tend to handle them, as a manager you must make decisions. When you interpret the organization’s rules, policies, and practices you provide crucial guidance that affects team performance. When you make decisions about what the team will do and where it will focus its attention, you’re helping determine the team’s direction and priorities.Understanding the true nature and scope of the job of the manager is critical to your success. And ultimately your success has a direct bearing on the success of your team and your entire organization. I need to make a confession. Frankly, I’m biased against the term “boss.” It’s an old label from the days when the person in charge of a crew or group of workers really did “boss” them around. “Do this! Do that! Do it this way!” Although there are settings or situations when having someone clearly in command makes good sense – first responders in emergencies and military combat come to mind – the term is really outmoded today. Still, it is short, easy to say, and everyone knows what you mean when you refer to “my boss” as the person you report to within your organization. The relationship with your own boss is one of the most important work relationships you have. When you and your boss are generally on the same page, have good rapport, and communicate reasonably well, you’re much more likely to enjoy your job. On the other hand, if your relationship with your boss is strained, you don’t have good communication, and your ideas about how to get things done are substantially different, your daily interactions can quickly become conflict-ridden and, well, a grind. What other specific expectations do you think your manager has? If you aren’t sure, maybe it’s time to ask – having a conversation about what you think they expect and what they actually do expect might be a highly useful discussion. After all, if you aren’t clear about what is expected, it’s going to be difficult to be effective as a supervisor or manager. Help your boss manage you. It might just be the most important thing you do this year. If this sounds daunting, it should. The skills and behaviors that made you an effective member of the team – one of “us” – are not necessarily the same skills and behaviors required to be an effective supervisor. And regardless of how close and how strong your relationships are with your teammates, those relationships will change once you become their supervisor. Still, with good communications, particularly good listening and a commitment to lead the team rather than “boss” the team, you can be successful when you are promoted in place. What’s been your experience?